The al Qaeda group responsible for beheading an American engineer said sympathizers in the Saudi security forces provided police uniforms and cars used during the victim's kidnapping, according to an Islamic extremist Web site. But a Saudi Arabian official says he thinks there's only a "very, very remote" possibility that the claim is true. The article recounting the abduction appeared in Sawt al-Jihad, or Voice of the Holy War, a semimonthly Internet periodical posted by al Qaeda in the Arabian Peninsula — the group that claimed responsibility for killing Paul M. Johnson, Jr. According to the account, militants wearing police uniforms and using police cars set up a fake checkpoint June 12 on al-Khadma Road, leading to the airport, near Imam Mohammed bin Saud University. "A number of the cooperators who are sincere to their religion in the security apparatus donated those clothes and the police cars. We ask God to reward them and that they use their energy to serve Islam and the mujahedeen," the article read. When Johnson's car approached the checkpoint, the militants stopped it, detained him, anesthetized him and carried him to another car, the article said. Earlier Saudi newspaper reports said Johnson was drugged during the kidnapping. The account on Sunday of the abduction of Johnson, who was later decapitated, highlighted the fears expressed by some diplomats and Westerners in the kingdom that militants have infiltrated Saudi security forces — a possibility Saudi officials deny. "The notion that our security services are infiltrated by the terrorists really doesn't hold. If that were the case, they would not be going after soft targets, they would be going after government installations," Adel al-Jubeir, Crown Prince Abdullah's foreign affairs adviser in Washington said on CNN. Police and military uniforms would be easy to find without assistance, he said, and Saudi authorities found in one of their raids on a terror base cars that had been painted to look like police cars. In a separate article on the Web site, the leader of the al Qaeda cell behind the abduction, Abdulaziz al-Moqrin, justified the targeting of Johnson, pointing to his work on Apache attack helicopters for Lockheed Martin. Al-Moqrin and three other militants were killed Friday in a shootout with Saudi security forces hours after Johnson's death became known. Johnson "works for military aviation and he belongs to the American army, which kills, tortures and harms Muslims everywhere, which supports enemies (of Islam) in Palestine, Philippines, Kashmir," wrote al-Moqrin. On Sunday, police continued their search for Johnson's body and the militants involved in his death. Police cars, armored vehicles and a large contingent of emergency forces blockaded the al-Malaz area Sunday in a search for suspects, security officials said. Witnesses saw suspects fleeing into a house in the neighborhood after police fired at them at a traffic light. Hours later, the blockade was lifted and security forces left. It was unclear whether anyone was arrested. On Sunday night, scores of Saudi men, mostly in their 20s and 30s, paid visits to the gas station where al-Moqrin and the three others were killed. "This should be turned into a national monument," said Mohamed Ibrahim Shakir. "Every Saudi should come here and pray to God. We got rid of these terrorists." The men counted more than two-dozen bullet holes in the facade of the run-down shop. Shopkeeper Ibrahim al-Shamari said the militant leader was shooting at security forces from behind a refrigerator when he was killed. "Every Saudi should be proud of this. I should have brought my wife and children to see the end of this man," Khalil bin Othman said. 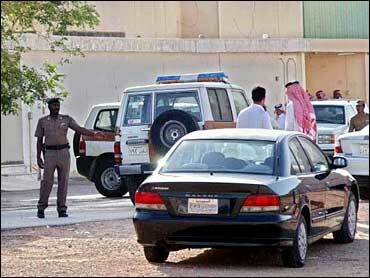 One security officer was killed and two were wounded in the shootout, the official Saudi news agency reported. Al-Moqrin is believed to have had a leading role in the stepped-up campaign of militant violence in the kingdom, which in recent months has seen bombings and gun attacks on foreigners. Western workers are critical to the Saudi oil industry, and many of them are staying despite warnings from their governments to depart because of terrorism fears. Johnson, 49, of Eagleswood Township, N.J., was seized June 12, the same day Islamic militants shot and killed Kenneth Scroggs of Laconia, N.Y., in his garage in Riyadh. Earlier that week, militants in the capital also shot and killed Irish cameraman Simon Cumbers, who was filming for the British Broadcasting Corp., and another American, Robert Jacobs, of Murphysboro, Ill.
Johnson's captors said they would kill him on Friday unless Saudi Arabia released jailed al Qaeda militants. Sunday's al Qaeda article said the militants decided to behead Johnson when al-Jubeir declared Saudi Arabia would not negotiate with the kidnappers. Meanwhile, in the United States, the leader of an anti-discrimination group called for tolerance after a sign reading "Stamp out Islam" was posted in the Johnson's hometown. Aref Assaf, president of the state chapter of the American Arab Anti-Discrimination Committee, issued an advisory to its members telling them to be vigilant. His organization had not heard of any violence committed against Muslims or Arab-Americans in New Jersey. "It's sad because we have lost a fellow American from New Jersey, but added to that our entire community is being castigated and blamed for the crimes of others," Assaf said Sunday. Phil Galasso posted the cardboard sign saying "Stamp out Islam" on a utility pole near his house in Eagleswood Township. It depicted a hand-drawn boot over a crescent and star. "I'm getting a little fed up with the mindless violence against civilians who had nothing to do with the war in the Middle East," Galasso said.